In a previous post I mentioned that I was working with Active Ingredient on their current project, A Conversation Between Trees. Well, that’s exactly what happened and we recently spent a few days in Rockingham Forest, Northamptonshire installing the work in the Fineshade Woods art centre. You can read up on the project over at the site, but for now I’m just going to talk a little about what I worked on. 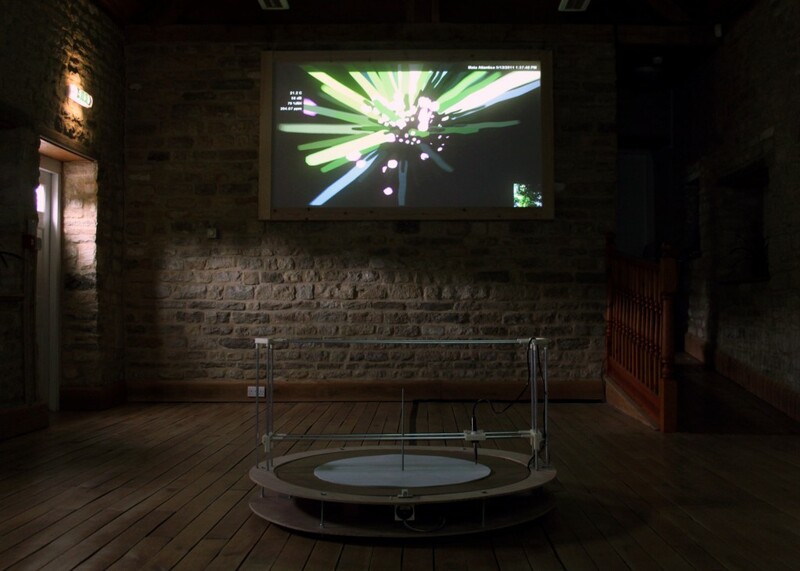 The main part of the installation involves projected visualisations developed in Unity 3D that show real time environmental data from sensors in trees in Sherwood Forest UK, and the Mata Atlantica, Brazil. To compliment these, we wanted to create something that would add some historical context to the data. Global CO2 levels in particular change slowly, and by very small increments that aren’t linear or continuous, so we wanted to add a more accumulative and temporal impression of the data allowing more of a ‘big picture’. The machine draws out CO2 data taken from the Mauna Loa observatory in Hawaii. This dataset is the longest continuous record of global CO2 data available, and has monthly readings dating back to 1959. Having data that covers such a large period of time allows us to depict the behaviour and effects of the increasing CO2 levels over the years. 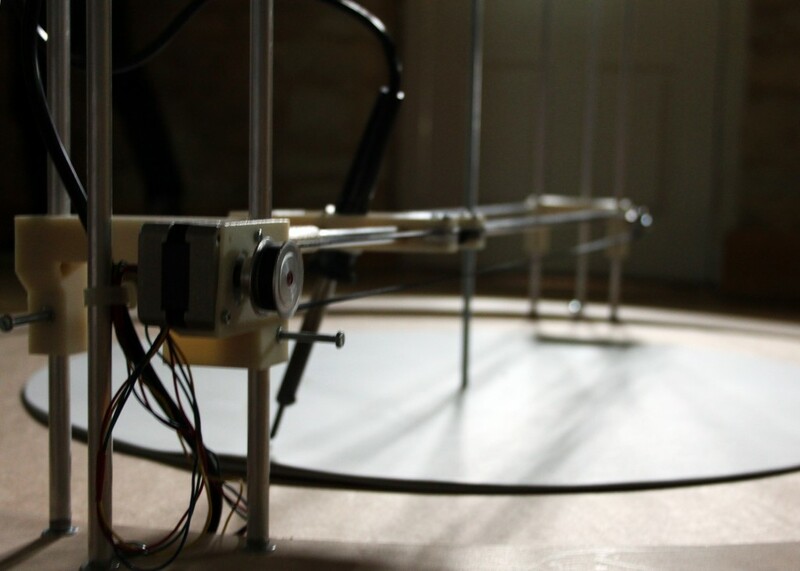 The machine consists of a revolving circular platform and an arm that moves between the center and edge of the paper depending on the CO2 level. The revolving platform represents time with one revolution of the platform representing one year. After one revolution the paper is removed and the machine starts again. Because each year is on a seperate sheet of paper, it gradually builds a stack of paper marked with 52 years worth of CO2 fluctuations. The data readings are monthly, so within one revolution there are 12 readings, and the arm plots lines between each data point. 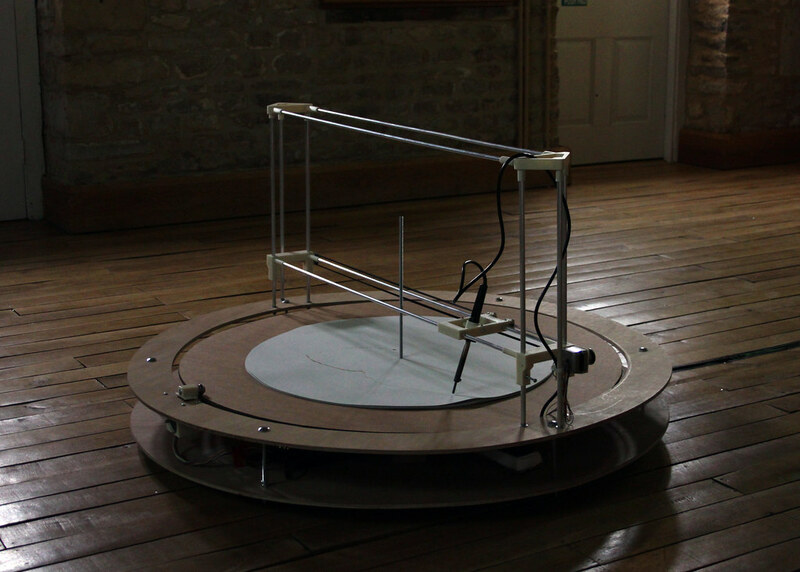 Arduino controlled stepper motors drive both the platform and arm, and the steps needed to draw lines between data points are calculated using Bresenham’s algorithm. This is done in Processing rather than Arduino, as it it made sense to do all the calculations on a laptop rather than the arduino itself. The processing sketch then just passes simple movement commands to the arduino which drives the motors accordingly. Lines are scorched onto the recycled paper using a soldering iron. We did a lot of experiments to test which papers scorched nicely, but didn’t burn, and which speed / heat combinations left the nicest mark on the paper. We’re not sure we’ve got this quite right yet and will continue trying different tips for the soldering iron and different speeds for the new surface area and heat combination that this will create. As well as forcing an uneasy contradiction by using a carbonising process to make marks, the act of burning symbolises the relationship between global CO2 levels and temperature. This brings us to an interesting point of discussion that has come to light through doing this project. 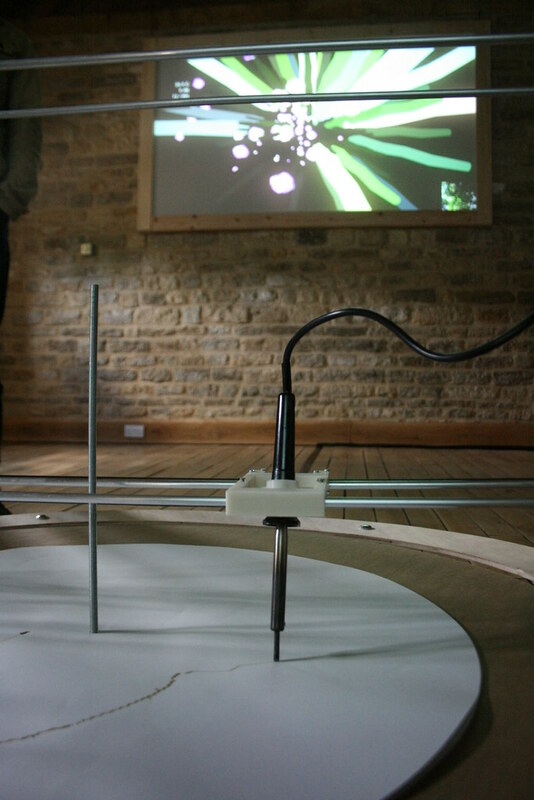 The team have discussed many times the role of technology led human intervention in environmentally engaged artwork. As ever, we have no answers, but these projects are about presenting information to provoke debate and dialogue around some very serious but complex issues without being prescriptive, or trying to force our views on the audience. This is still the first prototype, there are a few bugs to work out, and some more in depth design decisions to make but its a good starting point, and by the time the next exhibitions come around it will, of course, be flawless.